Tunnels 1, Simon 0… – The Epicurious Wanderers! Sunday we headed out with a guide and driver from Insider Journeys, the company we booked our trip with. 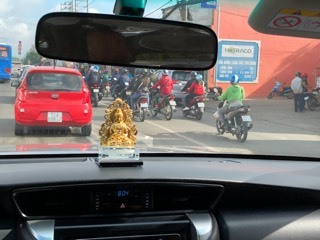 Although we’ve traveled quite a bit in South East Asia you never really get used to the traffic, it’s so different to home. There seems at times to be no rules, yet it just works and seemingly without any road rage. There may be lines marked on the road and traffic lights but we’re sure they are suggestions only as no one seems to take much notice. At one point two lanes marked and drivers creating four with motor bikes coming towards us at the same time. 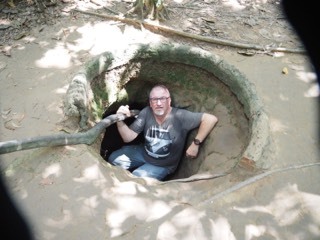 On the drive out to the Cu Chi Tunnels our guide talked about life in Vietnam and the impact of war. It seems that between the Chinese, the French and the Americans that Vietnam has had conflict of some sort going on for most of the last 100 years. As one group leaves or is defeated the next tries its luck. 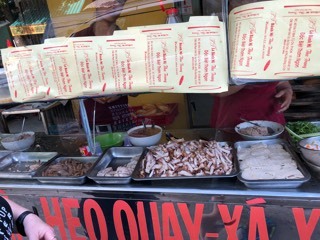 As we approach Cu Chi we stop for a snack, our guide is insistent that these are the best Banh Mi in the country, apparently he stops here every time he heads this way. Our roll cost 10 000VND, about 70c back home and oh my goodness, it’s amazing. The bread is so light, a perfect crust surrounding soft slightly sweet chewy insides fill with pork, Vietnamese herbs and a tangy dressing. We can see why he always stops here. After this we arrive at the tunnel site, we are early so the car park is strangely quiet and empty. After getting our tickets we head into the first tunnel, the one back under the road to the actual tunnels, later I would reflect that it would be nice if they were all this wide and spacious! The tour starts with a propaganda films from 1967, it’s quite confronting to hear of people be given awards for killing Americans and that this was celebrated. Again we are now hearing the other side of the story to the one we are taught about at home. After looking at models of the tunnels it’s time to enter them, we’re told there are exits at 20, 40, 60, 80 and finally at 100m’s along the way. Having toured the tunnels at the DMZ a few years ago, we suggest we’ll be fine to go all the way, our guide just smiles at us. As soon as we enter these tunnels I know that going all the way is not an option, these are much narrower and lower. Almost immediately I’m part crawling, part shuffling along in the inky blackness feeling quite helpless, moments later I slam my head in to the tunnel wall and that’s it I need to get out. It’s not just the pain that goes through my head but the shock of collecting the wall in the darkness. 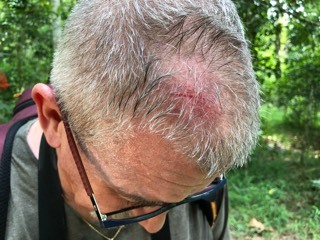 Actually I’m lucky, it turns out to just be a nasty graze, no stitches needed. After washing the dirt out I’m left with a bump and a slightly embarrassed look but no serious damage. 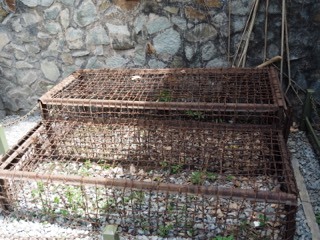 Back in the car we head back towards Ho Chi Minh City and a visit to the War Remnants Museum. On arrival we head to the top floor, the museum is setup top to bottom to guide you through the exhibits. It starts with a history lesson of the war. Displays show details of troop movements, casualty figures and damage inflicted upon the country. Some of the troop numbers don’t seem quite right based on things I’ve read at home, but again this is the story from the other side. Making our way down stairs we enter an exhibit based on a book called ‘Requiem’, a photo journalism account of the war seen through the eyes of war correspondents . It’s fascinating to view events through these images, but at the same time quite hard to look at knowing that many of these photographers lost their lives in the pursuit of these images. If we thought these images were hard to view the next floor really confronts us, here are the impacts of the war in shocking imagery. Image after image of the impact of the chemicals used on the country side and by default the people of this amazing country. Agent Orange not only destroyed the vegetation but left a lasting impact on the people through physical deformities that affected future generations. These images really are horrific and like the scenes from the Killing Fields of Cambodia a few years ago will stay with us for a long time to come. To lighten things up after this we do a little retail therapy, on her recent trip to NZ Helen was unlucky enough to lose the cable to charge her Garmin watch. No one at home sells just the cable, it’s a buy a new device game, our guide says he knows a place that can help. We enter Technology Park, a. Little hidden area selling everything out need and as per normal things that you just want. We score Helen’s charger cable and I’m tempted by a pair of Kef headphones that are about half the price of back home, I decide though to leave them for now. 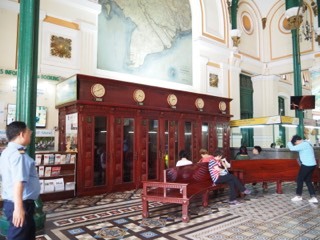 Next stop is the Post Office, what am amazing building, at first glance it looked like a colonial style railway station. It’s painted in the colonial yellow, as are many other buildings, that it seems the French just loved. It’s another example of buildings being recycled and reinvented as time has moved on. The once grand phone booths now house ATM machines or are used for taking photos with, the counters that once sent mail around the world now dispense a range of souvenirs to visitors like us. This brings our tour to an end and we are dropped off back at our hotel for a well earned rest. Rest time dispensed with it’s off to find some lunch and a drink. I’ve heard there’s a growing craft beer scene in Vietnam so we check out Pasteur St Brewery, just around the corner from our hotel. They have two tap rooms, the original upstairs and a newer area down stairs, heading up we find a small bar area with a good range of brews. 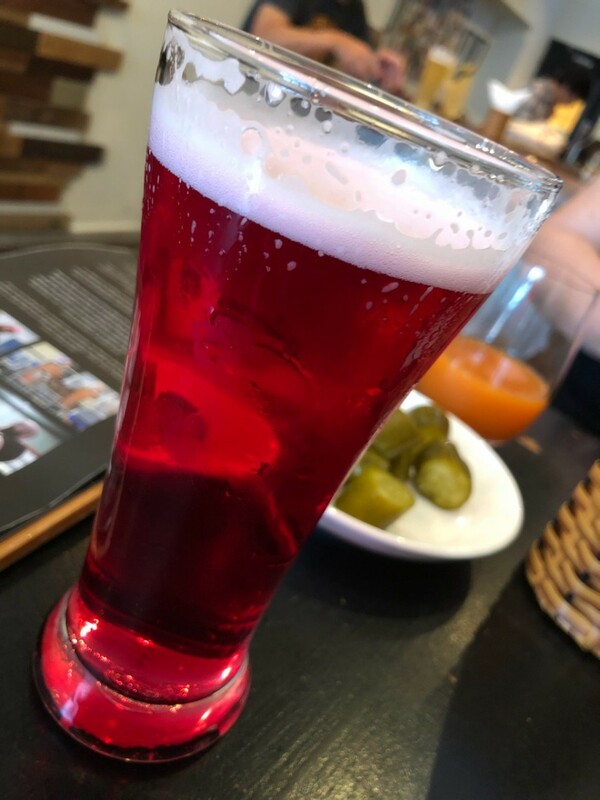 I settle on the Dragon Fruit Gose to start with, it’s a great example of the style with an eye popping colour. Sadly no cider for Helen, so she settles on a juice. Moving on we head for the Ben Thanh Market for some shopping. 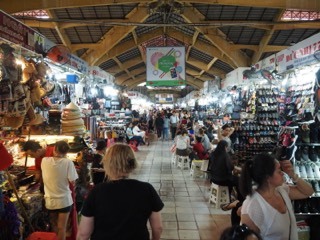 Wow, we’ve seen some markets but this is pretty intense, narrow walkways and everyone trying to sell you something. Clothes, hats, shoes, tableware, cookware, food; these markets have it all and then some. Eventually we find a stall with the table runners Helen wants, not sure if we overpaid but everyone seemed happy and we did beat the price down by about a third. After this we were about done for the day, so back to the hotel for a drink and a think about dinner. After the beers and a great burger at Pasteur St we decided not much was needed so just ventured next door to a food market for a light meal. Mm, think I over ordered again, my meal would have done about 4 people! Next a stroll around the area before calling it quits ready for our morning out with Adam on the bikes tomorrow. ← Good Morning Vietnam, we’re back!